IRRIGATION IS THE application of water to crops in addition to what normal local precipitation supplies. It is primarily used in areas with less than 20 in (51 cm) of rain per year (semiarid or arid climates) or in areas of monsoon rains with long dry periods. Irrigation allows growth of nondryland crops in semi-arid regions or can extend the potential cropping season to allow multiple crops. It is also used in some wealthier areas (for example, CALIFORNIA, MISSOURI, and ALABAMA) to take advantage of special crop subsidies and grow water intensive crops like rice or cotton. Irrigation has been used for thousands of years. Some of the earliest hydraulic civilizations were the FERTILE CRESCENT societies spanning from EGYPT’s NILE to Mesopotamia’s Tigris and Euphrates. Other ancient irrigation cultures have been found in PAKISTAN, CHINA, INDIA, the Andean regions of South America, MEXICO, and the southwestern UNITED STATES. Various methods of diverting and delivering water produced different levels of efficiency. The first irrigation schemes used simple diversions off of a river to flood entire fields. This method was the easiest to implement but wasted the most water. More specific application diverted water and then let gravity move water toward multiple ditches dug alongside crops. Simple yet ingenious devices were developed to raise river water up on to higher ground. For example, Egyptians first used the shaduf, which was a series of buckets on counterweighted poles arranged at various levels on the riverbank, to lift water to the level above. Later, they used the Archimedes’s screw, which was a large carved screw fitted into a hollow log. Draft animals turned large gears that turned the screw, catching and lifting water through the log to the higher land. Later, treadle pumps were devised in many poorer areas of the world so humans could power the pumps with their feet rather than use fossil fuels. Sometimes irrigation water was transported many miles to where it was needed. In Pakistan, qanats were deep tunnels dug from the distant mountains down to where villages needed water. Qanats moved water by gravity and protected the water from evaporation since the water moved underground. Shafts emerging at intervals at the surface allowed the workers to enter the qanats for maintenance. Irrigation generally required the combined effort of many farmers, so a variety of organizations and water laws were created to provide rules for individual use. The acequias of NEW MEXICO are an example of old Spanish water organizations created to maintain and oversee the distribution of irrigation water and maintenance of the waterworks. In the early 1900s, the United States created the Bureau of Reclamation to build massive dam projects and manage the diversion of water in the dry West to numerous irrigation districts. The green revolution of the mid-20th century combined new seed, fertilizers, fossil fuel energy, and irrigation to significantly expand crop output worldwide. Although this was a boon for the rapidly climbing global population, the use of irrigation seems to have only delayed a reckoning between an ever-increasing human population versus a finite supply of fresh water. Irrigation has continued to expand, and while it helps to produce higher yields, it has significant drawbacks that are becoming more obvious each year. First, irrigation changes the hydrologic regime of a region by reducing the historic flow of streams, dewatering some stream stretches or reducing recharge to connected groundwater supplies. Surface habitat is then degraded along these stream segments. The ARAL SEA is a good example of a large, once productive sea that is now polluted and shrunk to onethird of its original size because of upstream diversion of water to irrigate cotton. Stranded fishing boats now sit in the sand far outside the current shoreline, and the local economies and human health have never recovered. Many great rivers of the world have also lost so much water to upstream diversions that they rarely reach the sea anymore. The Yellow (HUANG) River in CHINA, and the Colorado River and the RIO GRANDE in the United States, are just a few examples of this. Groundwater tables have also dropped through over-pumping aquifers with fossil-fueled pumps. Some known examples of pumping these fossil aquifers are the Ogallala in America’s high plains, the Libyan desert, YEMEN, and SAUDI ARABIA. Some farm communities over the Ogallala have already disappeared once local irrigators ran out of water. Sanaa, the capital of Yemen has scant years before running out of its water supply. In areas where diverted water is delivered, groundwater levels can rise and move salts up into the root zones of crops, killing the crops and permanently ruining the soil. This is commonplace in arid areas, where thousands of hectares worldwide have become sterile and been abandoned because of soil salinization. Besides soil degradation, agricultural runoff carries pesticides, fertilizers and salts back into the stream or groundwater, degrading downstream habitat and poisoning groundwater needed for drinking water. Modern irrigation is also energy-intensive. When fossil fuels were more abundant, it made sense to use them to access as much water as possible. Relatively cheap oil and pumps helped proliferate irrigation around the globe and helped to speed the unsustainable rates of irrigation common today. Now in the face of increasingly limited supplies and even more global demand, the cost of pumping water will become a far more significant portion of the overall costs of irrigation and add to the cost of food production. Since the beginning of the 20th century, large dam projects have been built by wealthier countries to supply regions with irrigation water as well as flood control, municipal water supply, and hydroelectricity. More dams are now being built in developing countries, with the World Bank and other lending institutions helping to finance construction. Because 90 percent of the world’s children between now and 2050 will be born in the developing countries, the need for irrigation water to grow additional food is obvious. However, these dam projects are not without numerous costs, and their benefits do not flow equally to the inhabitants of the region the project is in. First, the location of the dam project inevitably displaces many villages, with little or no attention or assistance to help relocate those people. Impounding water spreads a variety of waterborne diseases in poor regions with little or no access to medicine or doctors. Aquatic habitats are drastically changed upstream and downstream of the dams, reducing the types and quantity of fish that were there before. Nutrients in the sediment that once flowed downstream during flood events is now caught behind the dam, leaving downstream valleys in need of alternative fertilizers. Impounding the water also changes the speed and temperature of the water upstream and downstream, again altering aquatic habitat and reducing fish species. Once the dam is filled and irrigation water is delivered, it does not tend to be delivered efficiently, effectively, or equitably. Consequently, vast amounts of money can be spent on irrigation projects that ultimately benefit only a few people relative to the needs of a region. Almost 90 percent of water consumed by humans is used for irrigation, and demand for water for all uses is increasing as human population increases and as consumption increases in parts of the developing world. Consequently, competition for water is rising everywhere. Irrigation water is applied to over 40 percent of the world’s crops, so any gains in efficiency in this sector would supply additional water for other competing uses. 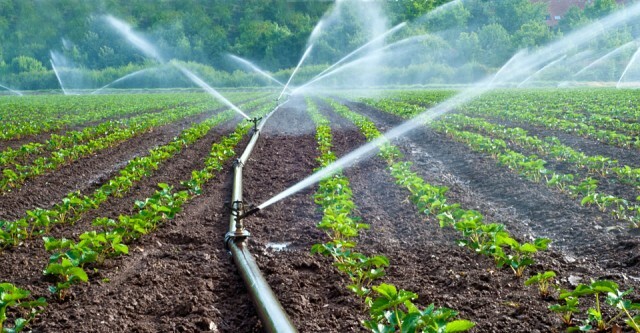 Modern irrigation practices have increased efficiency by using drip hoses laid at the base of plants or have installed low-hanging sprinklers from center pivot systems to apply the water directly to the plants rather than spraying it up in the air and losing more of it to evaporation. A rising trend in developing countries is to use sewage effluent for irrigation water. Ten percent of the world’s irrigated crops are now irrigated with sewage effluent, which is either partially treated or not treated at all. Despite the health threat to farmers and consumers from using sewage effluent, farmers continue to use it since it is more reliable than local rains and so guarantees them a more reliable income. Farmers will often sell this produce at distant markets so no one will know its provenance or the pathogens it may contain. Irrigation had fed the world’s people for millennia but must keep adapting, refining, and reinventing itself to continue as a solution for agricultural production.